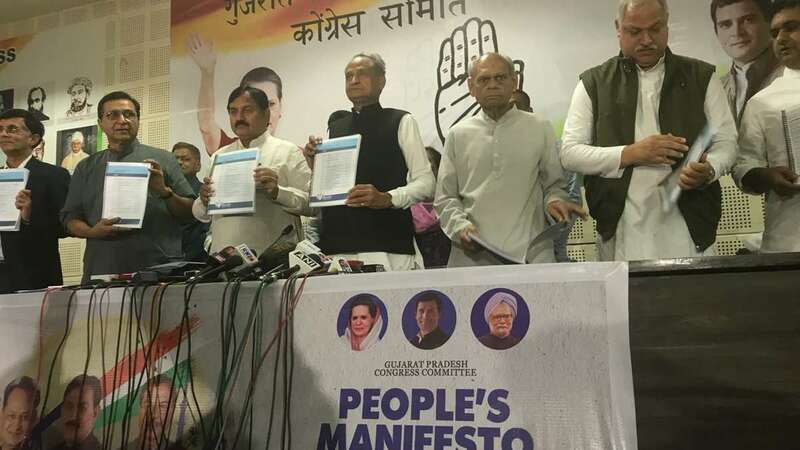 Ahmedabad : The Congress on Monday issued its poll manifesto for the Gujarat assembly polls, promising debt waiver for state farmers and an assurance on reservation for the Patidars. In case the Congress returns to power, farmers' debts will be waived and Minimum Support Price of farm produce at taluka level declared even before sowing starts, the party promised in the manifesto, which was released by the Congress state unit. The Congress promised that without affecting the present 49 per cent reservation for scheduled castes and tribes as well as Other backward classes, the party's government will introduce a bill in the assembly at the earliest under Article 46 of the Constitution. "The communities specified under Article 46 but which have not received any benefit under relevant laws will be given equal opportunities for education and economic development. The rights and privileges enjoyed by the OBCs will be extended to the Extremely Backward Classes category," the party said. "In the next three years, the Congress government will complete all remaining works of micro network the Narmada canal. The farmers will be supplied 16 hours of daytime electricity and reduced connection charges. Farmers will be given three-phase electricity connections of up to two horse power connections," the manifesto said. "Today, the people of Gujarat are living in constant fear and they cannot express themselves. We want to resurrect their trust in the government through this manifesto, which not only looks to improve the state Gross Domestic Product but also the Human Development Index. The Congress is the only hope for that to happen," Gujarat Pradesh Congress Committee President Bharatsinh Solanki told the media here. He said the Congress will revert amendments/changes brought in by the Bharatiya Janata Party government in land acquisition laws brought in by the then United Progressive Alliance government in 2013. Besides, the Goods and Services Tax on agricultural equipment, inputs and produce will be exempted, the opposition party promised. The Congress said a giant statue of Bhim Rao Ambedkar would be installed in the Gulf of Cambay (Khambhat), in a bid to appease the Scheduled Castes. Unutilised government surplus land will be alloted to landless SC families, the party said. "There's a huge backlog of vacancies in government offices. The Congress will ensure filling of vacancies within six months. The Congress government will also abolish contractual system, fixed-salary jobs and regularised them all." The Congress manifesto promised to make the state's women feel safer and secure. "One-stop crisis centres will be set up in all districts to prevent violence against women. Women protection officers up to the rank of Deputy Superintendent of Police will be appointed in each districts. The number of women police stations will be increased."